Today we are going to revisit one of my favourite summer fruits: the golden kiwi. Among the first posts on my newly fledged blog was one focused on my love for the golden kiwi and how it changed my relationship to kiwifruit in general. Never a big fan of green kiwi (fibrous, tart, kind of metallic tasting), I changed my tune completely after discovering the delicious yellow kiwi (smooth-textured, sweet, and lemon-fragrant). So when the folks at Zespri Kiwifruit were looking to sponsor a blog post featuring golden kiwi, I jumped at the chance. I have been wanting to write this post for years (I hinted about it here) and now I have no more excuses for putting it off. Regular readers of my blog know that, although I get steady requests, I have only accepted sponsorship from one other company before this – a company whose top-quality ingredients have been part of my pantry since before I even had a blog. That is my standard of post sponsorship, and Zespri fits those parameters perfectly. 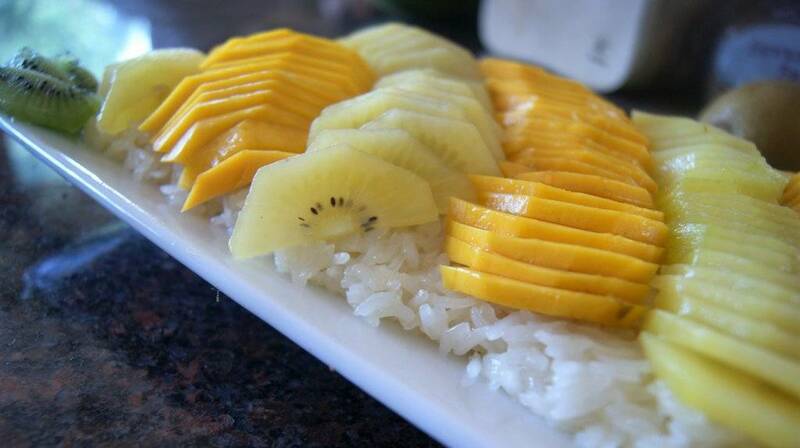 Although I almost always eat my kiwis as an out-of-hand snack, I sometimes save a few for this, my favourite Asian dessert: Thai Sweet Rice with Golden Fruit. 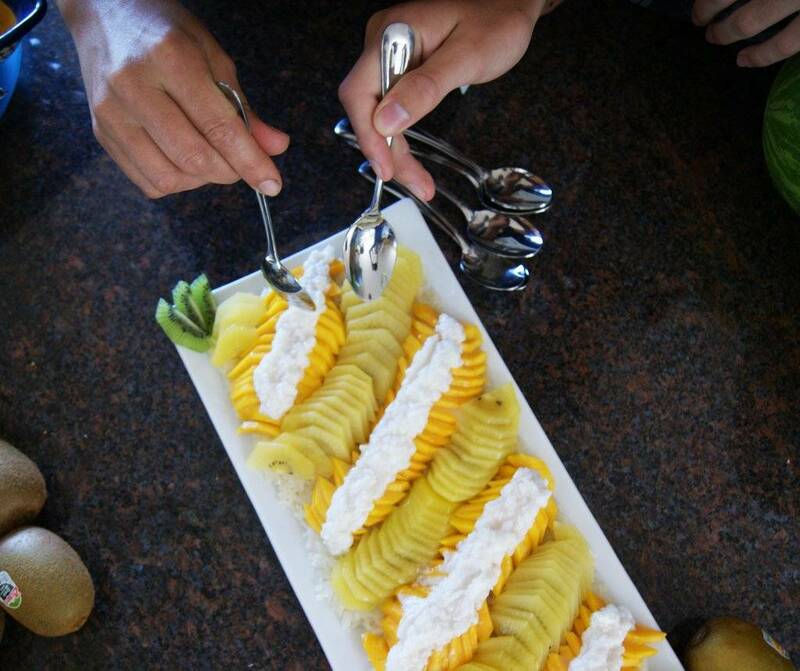 This drool-worthy and unusual dessert recipe comes from my popular Thai cooking class. The finished texture is never mushy, but pleasantly chewy and firm. 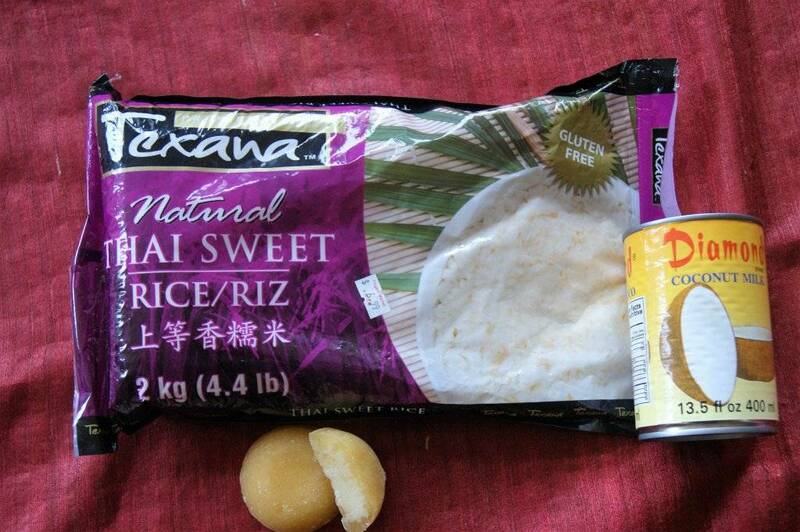 It tastes exactly as what it’s made of: a sweet coconut rice topped with perfectly ripe fruit. The fruit, far from a garnish, plays an equal role in this recipe. 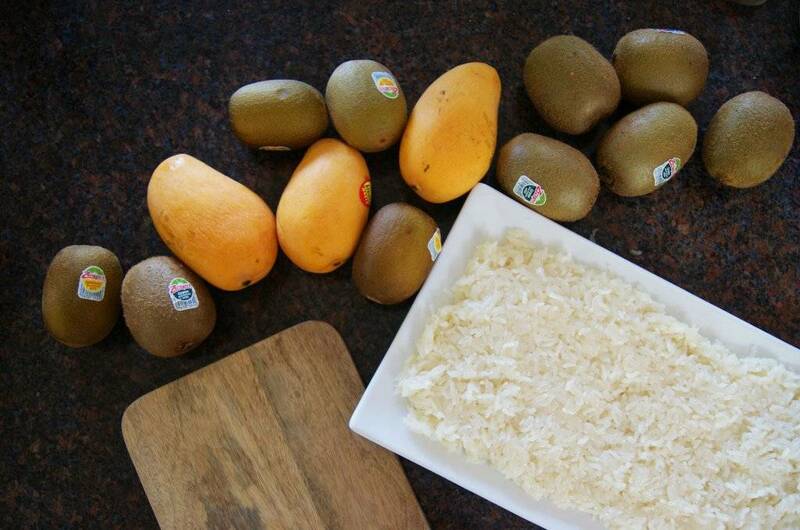 Every mouthful should play the rich silky coconut rice against the juicy sweet-tart golden fruit. Many class participants who don’t like rice pudding still love this recipe, and those who enjoy rice pudding love it, too. Given that my basic Thai cooking class is so popular, most of you have this recipe already (I’m only partly kidding), but depending on the time of year when you took the class, you will not have tried the golden kiwi version. And you MUST try the golden kiwi version. 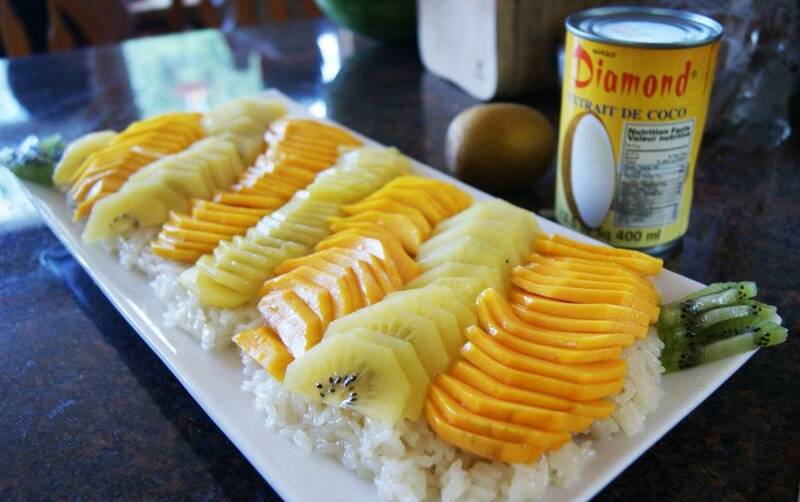 The sweet-tart balance and nectarine-like texture of golden kiwifruit is a perfect foil for the coconut rice. 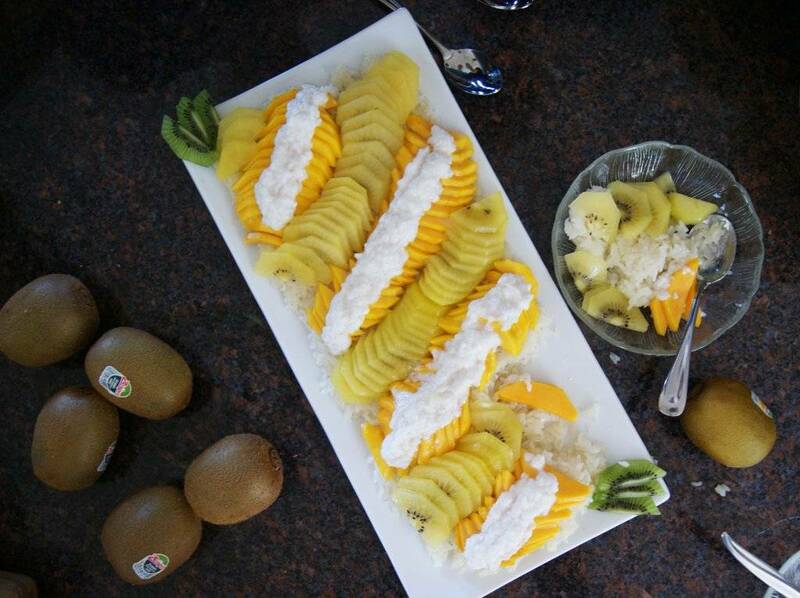 This dessert is traditionally served with sliced mango, and I think it is enhanced, in looks and taste, by the addition of golden kiwi. 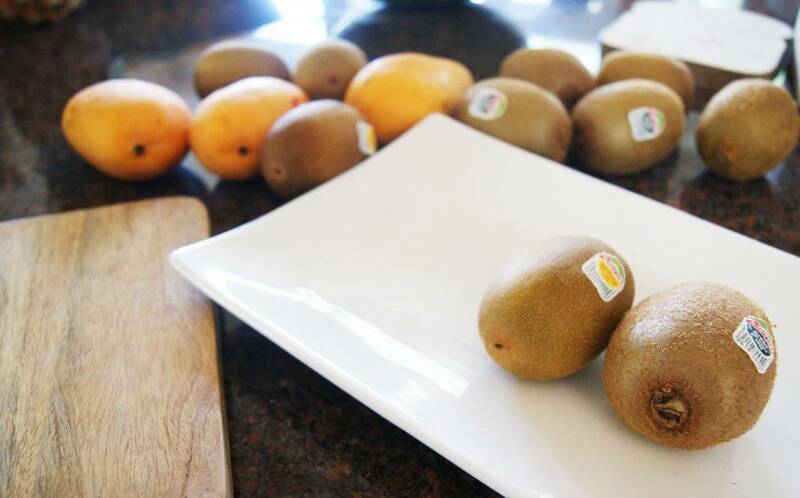 Even if you don’t get around to trying my recipe this summer, you should definitely try a golden kiwi if you haven’t already. They are available in supermarkets only through the summer, sometimes until early October. They may be a bit more expensive than green kiwifruit, but they are worth every. single. penny. They taste like a cross between a lemon, a strawberry, and a nectarine. They are higher in Vitamin C than oranges, richer in potassium than bananas, and higher in fiber than bran flakes, but low on both FODMAPS sugars and the GI scale. My preferred way to eat golden kiwifruit is to cut the fruit in half and scoop the delicious part into my mouth with a spoon. My children, the savages, eat their kiwifruit skin and all, as if they were apples or peaches. It works for them. Ha, maybe I should try serving them this pudding with unpeeled kiwi next time – maybe they will keep their spoons out of it long enough for me to take a picture! A favourite dessert – light, delicious and unusual. 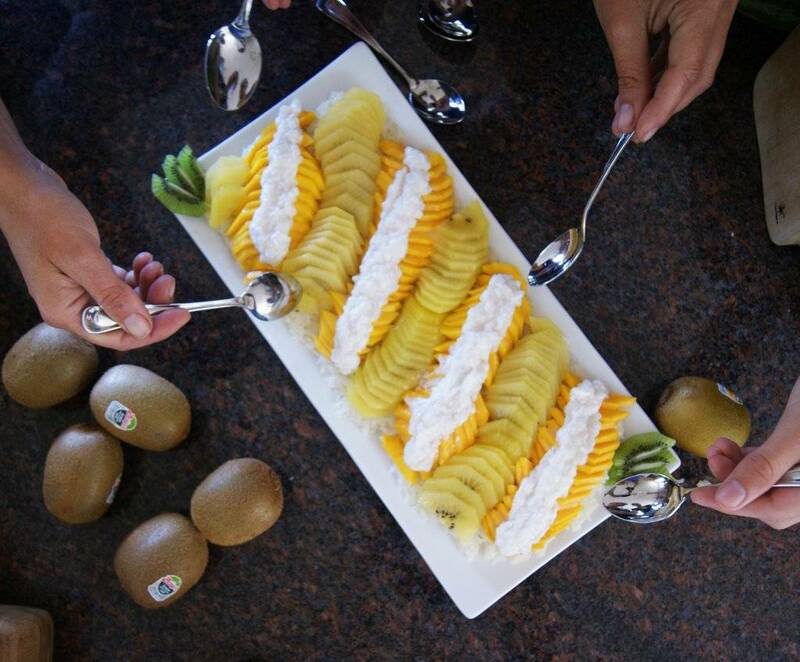 The combination of golden kiwi and mango take this to the next level. Place the rice in a bowl and cover with cold water. Swish with your hands to rinse the extra starch off the rice. Drain well. Place the rinsed rice back in the bowl and cover with fresh cold water. Soak for at least 4 hours at room temperature or, refrigerated, overnight. If you are in a hurry, you can soak it in warm tap water for 2 hours. Drain rice. 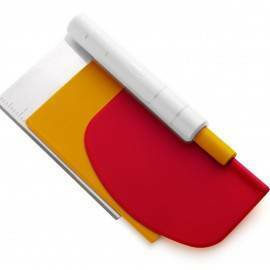 Line the bottom of a bamboo steamer or collapsible metal steamer with several layers of cheesecloth. Place the rice in the steamer, spreading it out to an even thickness. 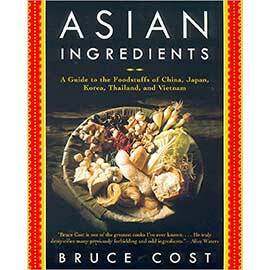 Place the steamer in a wok or flat sauce pan that has 2 inches of water in the bottom. The water should not be high enough to touch the rice. Place the pan on a burner and turn to high. 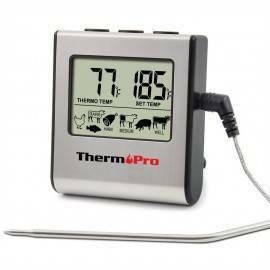 Bring to a boil, cover, and reduce heat to medium or medium-high to maintain a steady flow of steam. 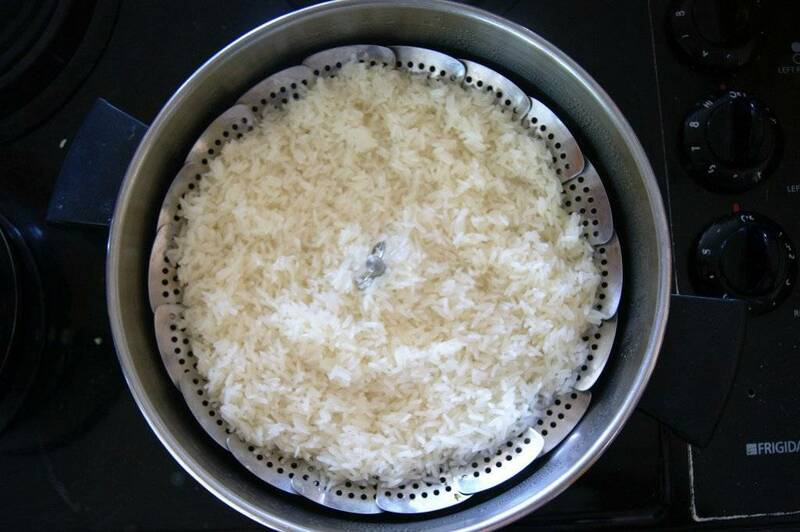 Steam the rice of 35 to 45 minutes, adding water to the pan as needed to prevent it from drying out. 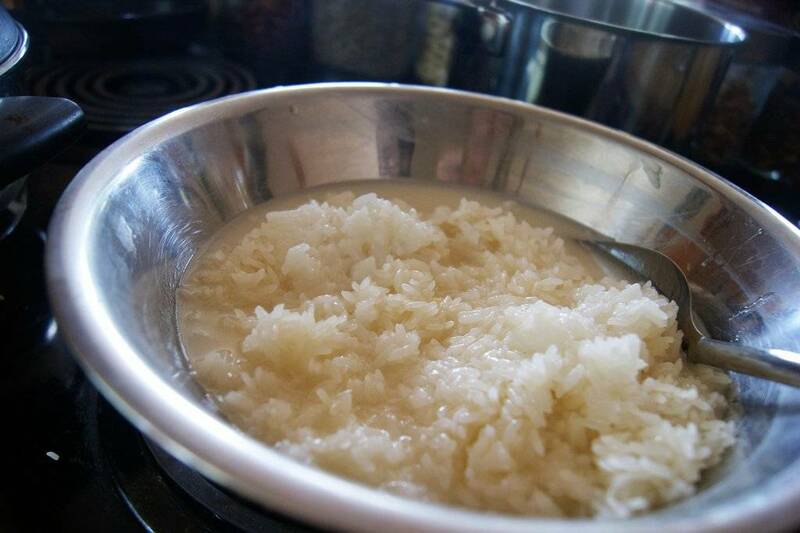 The rice is cooked when it swells, turns clear and shiny, and is sticky enough to be squeezed into clumps. While the rice is steaming, open the can of coconut milk. Empty contents into a small saucepot. Add the salt and the palm sugar. Cook, stirring, over medium heat until sugar dissolves. Remove from heat and set aside. To make the optional coconut cream topping: open the second can of coconut milk. It will have separated into a thicker coconut “cream” at the top of the can, and a thinner coconut “water” at the bottom. Scoop off as much of the cream as possible and place in a bowl – you will hopefully have between 200 and 240 ml (discard the water, or save for another use). Mix the ¼ tsp salt and the 1/3 cup granulated sugar into the bowl with the coconut cream. Place the bowl in the fridge to chill until ready to use. Once the rice is cooked, remove it from the steamer and dump it into a large bowl, peeling off the cheesecloth as you do so. Pour the warmed palm sugar-coconut mixture over it and stir to combine. Cover the rice and set aside until liquid is absorbed, about 30 minutes. Spread the warm sweetened rice on a serving platter and smooth the top. Let cool to room temperature. 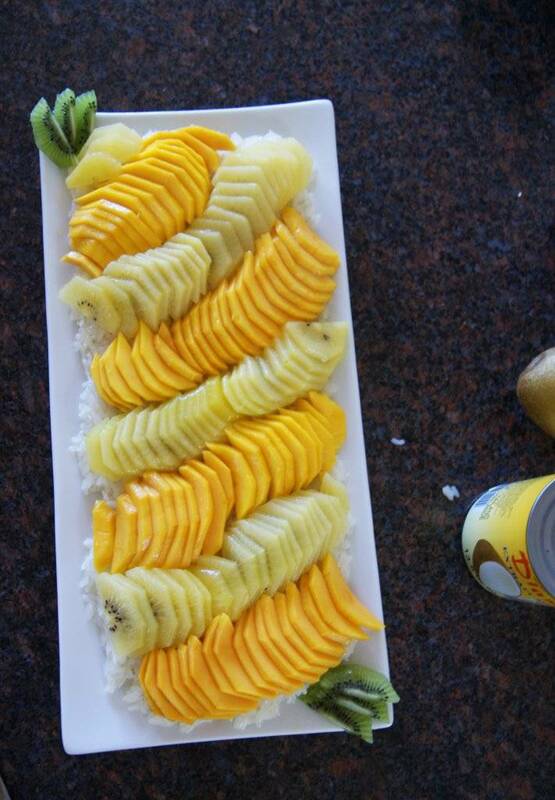 Cover the entire surface of the rice with alternating rows of sliced kiwifruit and mango. If using the topping, dollop or drizzle it in attractive patterns over the fruit. Serve immediately, making sure every person gets an equal portion of fruit and sweet rice. Thank you for sharing this. Looks lovely.